A few things that New York City Marathon runners – and spectators – can teach the world. One of the biggest thrills of my former life as a trombonist was working with Frank Sinatra. And one of the biggest thrills of working with Sinatra was performing “New York, New York” – it just doesn’t get any better than that. 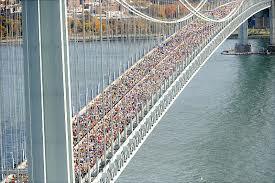 So standing with more than 35,000 runners on the Verrazzano Narrows Bridge at the start of last year’s ING New York City Marathon and listening to Frank blasting through the speakers made me more than a little emotional. It is, after all, New York. Gotham City. The Big Apple. It’s the site of some of America’s greatest moments. It has been the gateway for generations of immigrants and the welcome mat that is set out for the rest of the world. It’s also the city that brought us all together in its grief and taught us all a lesson in heroics. It is what it is. It is New York. Unlike many of my marathons (this was number 37), I ended up running this one on my own. I started with a couple of friends, but by mile six it was clear that in order for me to soak up and savor all that the event had to offer, I’d have to go it alone – which is a relative term when you’re in the throngs of racers and more than two million spectators. I told my friends to meet me at our designated after-race spot. By running without them, I wouldn’t diminish my own experience by trying to see it through someone else’s eyes. 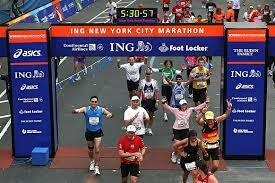 Maybe it sounds simplistic, but the New York City Marathon could only occur in New York. There are other great big-city marathons – Chicago (my hometown) and London come to mind. But as great as they are, they aren’t equal to New York. It isn’t just the course. It isn’t even just the city. New Yorkers themselves make this event what it is. It’s the old woman in a beat-up coat in Brooklyn handing out aspirin and seltzer water; the woman in Queens with a coffee urn filled with espresso; the woman in Manhattan passing out bananas; and the young man in Harlem offering us his Halloween candy. The joy, the encouragement, and the pride may have presented themselves differently in each neighborhood, but the excitement was the same. Cheering for us, an international mass of humanity running within feet of their homes, brought out the very best in everyone. On that day, we seemed to achieve what generations of politicians and philosophers have failed to do. With nothing more than our running shoes, we accomplished what all the wars and weapons have failed to do. We were, for a few hours anyway, a community of people whose sameness was more important than our differences. I’m not saying running could solve all of the world’s problems, but I think it would be a good start. On that day in New York, people of different religions, colors, and ethnic backgrounds supported and encouraged one another. For at least one day, the most important race was the human race. At least that was my experience. Could that happen anywhere other than New York? Maybe, but I don’t think so. It is, after all, New York. It is where everyone – from a very fast woman from Kenya to a very slow man from Chicago – are given the keys to the city. And on marathon day in that city of cities, all that matters is that we are runners.